Our 7 day weather forecast for Neasden updated throughout the day, making it ideal for planning leisure activities, travel and events. Read more about our weather forecasts. On Monday 22nd April 2019 the sun will rise at 05:52 and will set at 20:09. It will be a mild day, with temperatures reaching around 22.5°C. Today is expected to be a dry day, with a very low chance of rain. It will be quite a breezy day, with a maximum expected wind speed of 13mph. On Tuesday 23rd April 2019 the sun will rise at 05:49 and will set at 20:11. It will be a mild day, with temperatures reaching around 20.3°C. Today is expected to be a dry day, with a very low chance of rain. It will be quite a breezy day, with a maximum expected wind speed of 12mph. On Wednesday 24th April 2019 the sun will rise at 05:47 and will set at 20:13. It will be a mild day, with temperatures reaching around 15.8°C. A light shower is possible, 2mm of rainfall is possible today. It will be quite a breezy day, with a maximum expected wind speed of 20mph. On Thursday 25th April 2019 the sun will rise at 05:45 and will set at 20:14. It will be a mild day, with temperatures reaching around 14.2°C. A light shower is possible, 2mm of rainfall is possible today. It will be quite a breezy day, with a maximum expected wind speed of 22mph. On Friday 26th April 2019 the sun will rise at 05:43 and will set at 20:16. It will be a mild day, with temperatures reaching around 16.2°C. Today is expected to be a dry day, with a very low chance of rain. It will be quite a breezy day, with a maximum expected wind speed of 21mph. On Saturday 27th April 2019 the sun will rise at 05:41 and will set at 20:18. It will be a mild day, with temperatures reaching around 14.4°C. A light shower is possible, 1mm of rainfall is possible today. It will be quite a breezy day, with a maximum expected wind speed of 25mph. On Sunday 28th April 2019 the sun will rise at 05:39 and will set at 20:19. It will be a mild day, with temperatures reaching around 11.2°C. Today is expected to be a dry day, with a very low chance of rain. It will be quite a breezy day, with a maximum expected wind speed of 12mph. Our weather forecast for Neasden is updated throughout the day and has been found to be very reliable for planning activities such as days out, leisure, travel, events, fishing, golf and gardening. 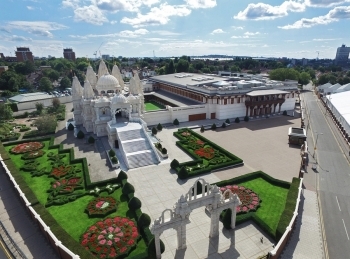 BAPS Shri Swaminarayan Mandir (popularly known as the Neasden Temple) is a masterpiece of traditional Hindu design and exquisite Indian workmanship in the heart of London. Using 5,000 tonnes of Italian and Indian marble and the finest Bulgarian limestone, it was hand-carved in India before being assembled in London in just 2½ years. Since its opening in 1995, this renowned place of worship attracts around 400,000 visitors annually. Come and marvel at the intricate carvings, experience a traditional Hindu prayer ceremony, or learn about the world’s oldest living faith. Enjoy hours of beauty, peace and discovery, all year round. Everyone is welcome. Entry is free. For a visual introduction, see http://youtu.be/duHXN6aEnak.